The company has already launched a number devices this year like Xiaomi Redmi Note 3, Mi 5 and Mi Max. The company might be launching this phone to give a fight to Moto G4 series, Samsung Galaxy On5 Pro, Lenovo K5 Plus and the other smartphone. Over the specifications, the device includes a Dual SIM (Micro-SIM/ Nano-SIM, dual standby) slots. It comes with a 5.0 inches (71.1% screen-to-body ratio) screen with a resolution of 720 x 1280 pixels (294 PPI pixel density) IPS LCD capacitive touchscreen. The smartphone is powered by a Qualcomm MSM8937 Snapdragon 430 chipset. It features a Quad-core 1.4 GHz Cortex-A53 and Quadcore 1.1 GHz Cortex-A 53 with Adreno 505 GPU. It comes in two variants regarding RAM and internal storage. The device comes in 16 GB internal and 2 GB RAM. And the Other variant comes with 32 GB internal memory and 3 GB RAM. The internal memory can be expandable up to 256 GB using a microSD card. The device is enriched with a 13 megapixels primary camera of aperture f/2.0 with face detection, auto-focus and LED flashlight. The primary camera records a video of 1080p at 30fps. The secondary camera has a lens of 5 megapixels with f/2.2 aperture and video recording at 1080p. The camera features Geo-tagging, touch focus, face/smile detection, HDR, and panorama. The device has a 3.5 mm jack in it. The smartphone also supports fast battery charging technology. Xiaomi Redmi runs MIUI 7 based on Android 6.0.1 Marshmallow. The dimensions of the device are 139.30x 69.60x 8.50 mm and weighs about 144 grams. The device comes with some extra features like fingerprint sensor, accelerometer sensor, gyro sensor, proximity sensor and compass with it. The phone is powered by a 4,100 mAh Li-ion battery which will be non-removable. 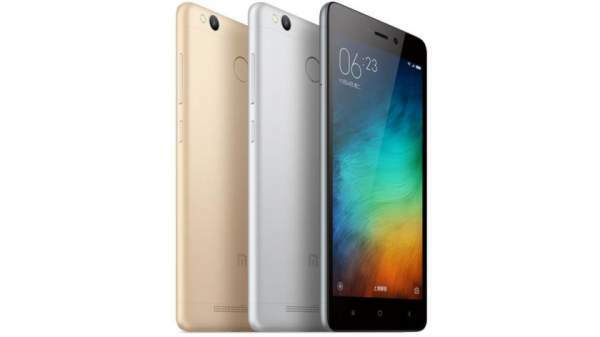 These were the features and specifications of Redmi 3S recently launched in China. But no-one knows what the company is going to offer to its Indian customers. What we could do, is to wait for the launch of the device which is not too far. The device is going to launch in India in the next week. The device comes in different colors to attract the customers. The company would be selling the device in Gold, Silver, and Grey color options. The price of the device in the Chinese market is 699 Yuan which is approximately Rs. 7,000. So, the expected price in India of this price is around Rs. 7,000.